Marc Newsham dived in to head home a James Gregory cross to give Club a 17th minute lead. Gregory was the provider again for the second six minutes later cross for Mitch Dunne to sidefoot home. Pontefract got one back almost immediately through a Eli Hey penalty. The visitors then restored parity on 36 minutes with Jack Greenhough sending a looping header over Club keeper Ross Durrant. Sheffield regained the lead inside the first minute of the second half, Jamie Yates heading in a Charlie Wakefield cross. Back came the visitors again on 65 minutes to tie the scores again at 3-3 with Jake Picton getting his head to a free-kick. Club though were determined not to be denied and when Gregory was fouled on the edge of the box on 70 minutes, Andy Gascoigne arrowed the resultant free-kick into the top corner before Club sealed the points with the fifth three minutes from time as Dunne set up Newsham for an easy tap in. Stocksbridge Park Steels looked on course for a point at Lincoln United until a late penalty gave the hosts a narrow 2-1 win. Lincoln were in front inside the second minute when Kevin Hemagou drilled a shot under Jordan Greaves into the far corner. Steels were back on level terms as defender Liam McFadyen showed a strikers’ instinct at a corner to score from close range. That appeared to be enough to give Stocksbridge a second successive away draw until Lincoln won a penalty six minutes from time, Paul Grimes confidently tucking it away. Frickley Athletic saw their perfect start come to an abrupt end as promoted AFC Mansfield left Westfield Lane with all three points, from a 3-2 victory after the hosts had let slip a two goal lead. Comical defending by the visitors left Jacob Hazel with a simple tap in to an unguarded goal after just seven minutes. Hazel then pulled the ball back for Jack Burton to make it 2-0 on 14 minutes. However, Mansfield turned the game on its head in the second half scoring three times in 20 minutes to leave Spencer Fearn’s side shellshocked. It was FA Vase First Qualifying Round day for the majority of the Toolstation NCEL teams and a rather successful one it was too for the region’s teams. Swallownest, playing their first home game of the season, edged through 1-0 against NWC league side Abbey Hey 1-0 and in doing so extended their unbeaten run to four games. Both teams had a player dismissed in an eventful first half. There was only four minutes on the clock when James Short was fouled by Abbey Hey skipper Lewis Edwards who was promptly shown a red card. Swallownest lost their one man advantage however just before the half hour mark as Jermaine Atkin was given his marching orders for a rather clumsy tackle. The deadlock was finally broken on 34 minutes with what proved to be the winning goal, Tom Cropper rifling home low and hard from close range to set up a home tie against AFC Blackpool in the next round. Parkgate twice came from behind to beat Chadderton 5-2 at Green Lane following extra-time in a tie that saw the experienced duo Ashley Burbeary and Glynn Cotton make their debuts. The visitors went 1-0 up inside the opening nine minutes but the Steelmen were back on level terms two minutes before the interval, Zakk Khalifa getting his reward by rounding the ‘keeper moments after hitting the post with a 25-yard curler. Chadderton regained the lead midway through the second half but Parkgate were back on level terms 12 minutes from time - Andy Fox scored direct from a corner to take the tie to extra-time. Chadderton were down to ten men on 90 minutes and Fox then put Parkgate in front for the first time on 97 minutes, cutting inside to find the top corner. Brandon Bagley turned in a cross to give the home side some breathing space on 110 minutes. 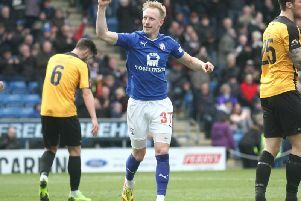 The icing was put on the cake when Fox completed his hat-trick from the penalty spot after Khalifa had been brought down with almost the last kick. The only blot on the copybook was Khalifa being shown a red card for retaliation. Worksop Town stretched their unbeaten start to seven matches with a narrow 2-1 home win over NCEL Division One side Grimsby Borough. Matt Sykes gave the Tigers a third minute lead volleying in from a rebound. Steve Woolley doubled the advantage six minutes after the break clipping a shot over the keeper from a Liam Royles cross. Grimsby got one back seven minutes later but Worksop held on to seal a trip to Winsford United in the next round. Worsbrough Bridge Athletic overcame a tricky way tie at Division One rivals Armthorpe Welfare to go through 2-1. Jack Wilson gave the Briggers the lead in first half stoppage time, stabbing in a corner at the far post. The lead was doubled three minutes after the break with a superb Fidel Mhlolo solo effort. Armthorpe got one back on 79 minutes when Jason Kearsley tucked away cross at the near post but it proved no more than a consolation effort. Maltby Main and Staveley MW both eased through to the next round. Maltby dumped out Ashton Athletic 5-1 at Muglet Lane with goals from Danny Frost (2) Jonathan Hill header, Nicky Darker and Ryan Carroll. Staveley MW produced an excellent performance to go through 5-0 at Selby Town. Jamhal Riley had the Trojans in front on 17 minutes before grabbing a second after the break. Matty Parkin made the tie safe on 70 minutes looping the ball over the keeper before Joe Pugh added the glass with a late brace..
Harworth Colliery went out 2-1 at Cammell Laird as the hosts scored twice inside the last six minutes after Harworth had taken a 75 minute lead through Ainsley Finney. Penistone Church suffered a surprise 2-1 exit at Shelley FC after Sam Scrivens had given Church a fifth minute lead. AFC Emley suffered late heartache as they bowed out, beaten 4-3 at home against Litherland Remyca with the winner coming in stoppage time. Toolstation NCEL, League Cup First Round: Yorkshire Amateur v Handsworth Parramore.